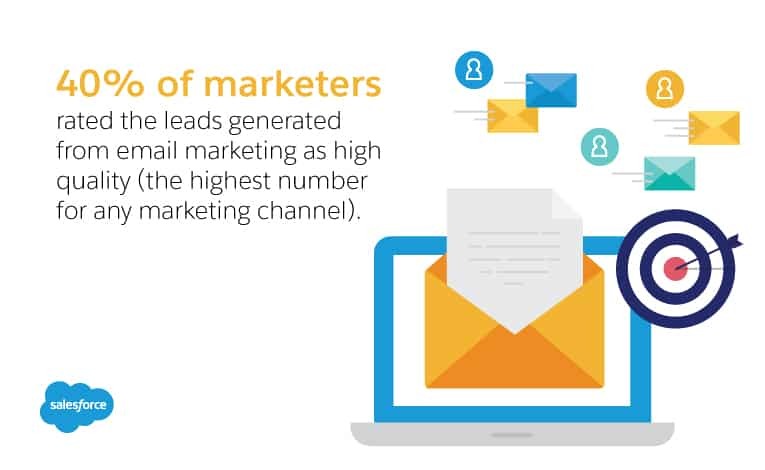 Among the different marketing strategies, email marketing remains one of the most classical yet the most effective ways to reach prospects, promote your brand and build relationships. According to statistics, emails have the highest return on investment. For every $1 spent on email marketing, there is a return of $32. Over the years email marketing has been a favorite among marketers because it is easy to plan, implement and improvise. If you are a beginner and want to know more about the nuances of email marketing, this will be definitely a good read for you. Email Marketing is not a stand-alone entity; there are many aspects to it like Segmentation, Personalization, and others. It is also related to Content Marketing, Relationship Marketing, Affiliate Marketing, and others. There are various factors which impact the success of different email marketing campaigns such as Open Rates, Personalization, Bounce Rates etc. 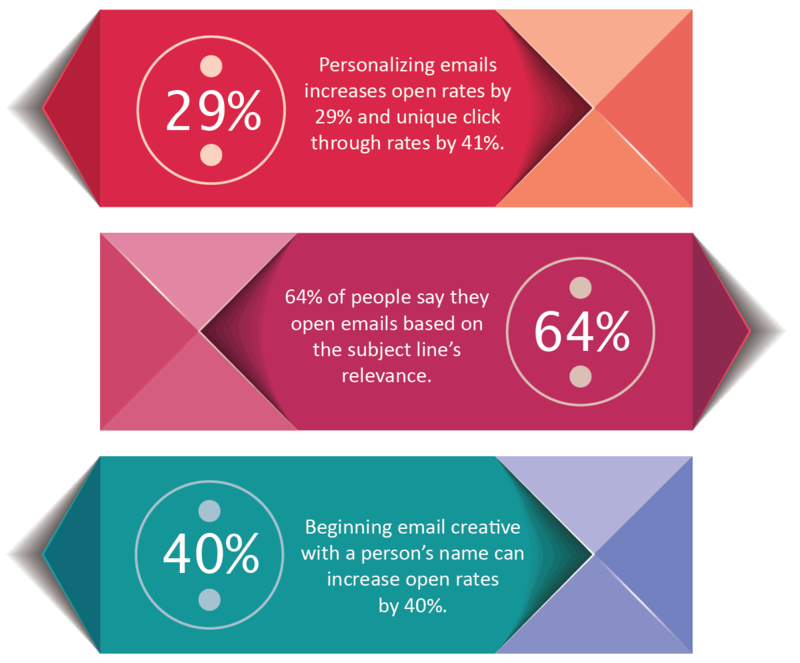 One of the most important factors which email marketers are interested in is Open Rate. Email open rate is the percentage of the total number of subscribers who have opened an email campaign. These rates depend on various factors including the subject line, relevancy for subscribers, personalization, content etc. However, a value in 20-40% range can be considered as a healthy open rate. 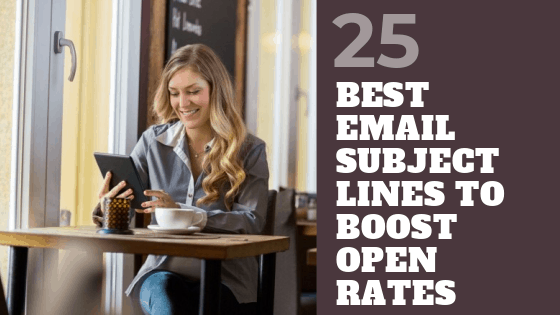 There are various factors which impact open rates and Subject Line is one of them. Email subject lines are as important as the body content. Did you know that 47% of email recipients open email depending on the subject line whereas 69% of email recipients report email as spam based solely on the subject line? 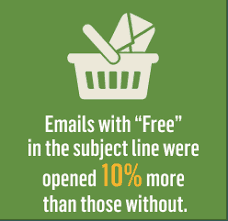 Subject lines are not only important to improve open rates, but also to summarize the content of emails. It shows urgency and relevancy of the email for the subscribers. Sp, the more eye-catching it is, the more people will feel like opening and reading the entire email. Email subject line is as important as the email body content. 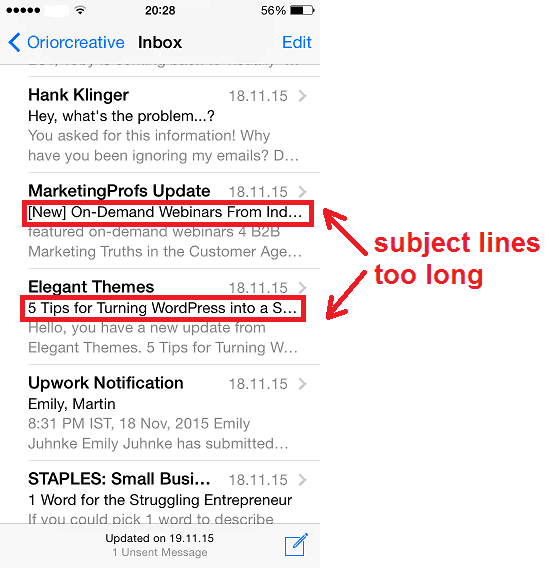 Now that you know about the importance of that ‘one line’ that has the potential to grab the attention of the email and urge them to open your email, let us take a look at some of the best examples from the industry. 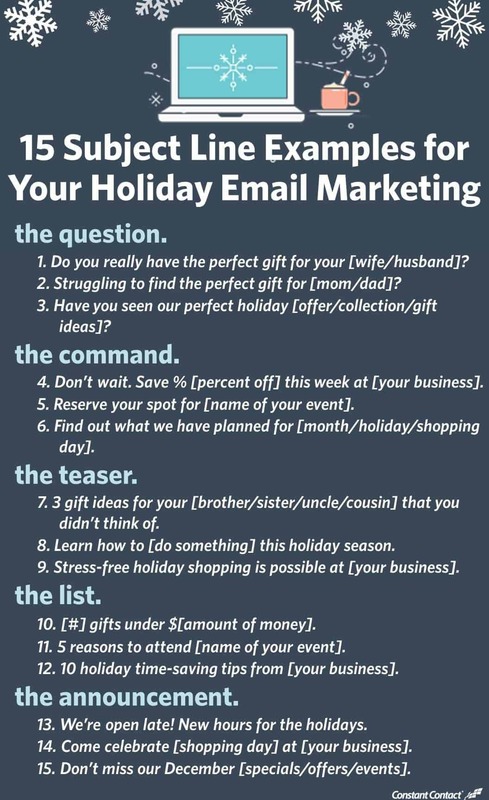 Here are some more on Holiday Email Subject Lines. 1. “Google sees smartphone heroics in Oreo. It’s The Daily Crunch.” – TechCrunch is a newsletter which keeps people updated about the latest news and developments from the world of technology. So, the usage of the words ‘daily crunch’ that keeps you abreast with updated information about technology, so you know you gotta read it. 2. “Where to Drink Beer Right Now” (Sent at 6:45 am on a Wednesday) – Could have been better timed by Eater Boston. After a busy day midweek, this can be the perfect thing to wake up to and ease out a bit. 3. “Uh-oh, your prescription is expiring” – Using conversational words like “uh-oh invokes the fear of missing out and Warby Parker used it to attract you to the fact that you probably need new glasses. 4. “Best of Groupon: The Deals That Make Us Proud (Unlike Our Nephew, Steve)” – It is very likely that a humorous or sarcastic subject line works the best. And Groupon uses this strategy to the best. It is like using the unexpected to compel the recipient to read on. 5.“*Don’t Open This Email*” – When we are told not to do something, we tend to be more curious to open the content and read. This is what Manicube used in their email subject line. 6. “What They Eat In Prison”, “DO NOT Commit These Instagram Atrocities” – A catchy language always urges the reader to look forward to some interesting stuff. Thrillist uses such eye-catching words in their subject line so that people open the content to read. 7. “Black Friday shoppers are the worst customers” – This came in a LinkedIn Pulse newsletter, promoting an article one of its users wrote on the topic of holiday marketing. Giving intriguing facts or sometimes figures to make the reader want to read more. 8. “10 bizarre money habits making Millennials richer” – Subject lines that are leading will always urge the recipient to know more about the subject. Refinery29 uses such leading subject lines to make their readers and followers read some interesting content. 10. “Is this the hottest career in marketing?” – Digital Marketer used this curiosity-inducing subject line to let readers know what’s interesting inside. Something that is fresh, something that is trendy definitely needs a subject line like that. 11. “👗 Free (Cool!) Clothes Alert 👖” – Clover uses visual content like emojis to lure readers to open the email. We all ‘like’ those tiny images and if it is something that you ‘love’, then definitely it will make you look for some offer or freebies inside. 12. “you free this Thurs at 12 PM PST? [guest blogging class]” – Mary Fernandez used personalization to reach out to new people and also existing followers. Personalization can really work wonders and urge the recipient to open the email as it makes them feel special. 14. “Rock the color of the year” – Etsy, the e-commerce website was able to promote a product solely based on color. With such intriguing subject, it is unlikely that you would want to know the ‘color of the year’. 15. Sometimes, straightforward subject lines also work best. For example, “[Company Name] May 2005 News Bulletin!” or “Eye on the [Company Name] Update (Oct 31 – Nov 4)” etc. 16. “As You Wish”- UncommonGoods knows its buyer persona and send them mail according to their wish list or interests. This comes as a reference from the movie The Princess Bride. 17. “Everything you wanted to know about email copy but was too afraid to ask” – CopyHackers uses one of your fears or pain points to urge you to take a quick look into the email. 18. “The price dropped for something in your cart” – These retargeting email subject lines can prompt you to visit your cart once again or complete some unfinished purchase. One more example– “Hey, forget something? Here’s 20% off.” by Bonobos. 19. “Tonight Only: Get this NOW before it’s gone…” – It is difficult to resist the fear of missing out. Violet Grey used this with an added incentive inside to increase email open rates. Alternately, “Weekend Only: Get this …” or “Last Day to Get…” can be used for promoting special product offers or freebies. 20. “New Video: (Topic)” – Email campaigns are not only to increase sales or revenue, but also to provide some value to the customers. This email from Beardbrand promotes useful content and information. Some video or tutorial inside needs to be advertised with a catchy email subject line. 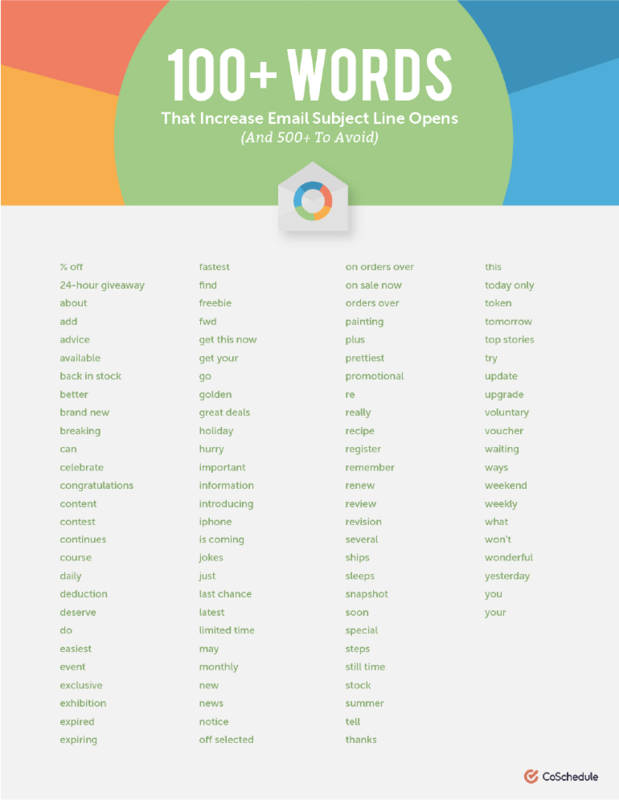 These straightforward and “boring” subject lines performed the highest out of 40 million emails, with open rates between 60-80. 24. “Products the celebs are wearing” – Sephora used this celebrity branding and vanity subject line to hit the emotional quotient of readers and make them open the email. 25. “Learn a language with only 5 minutes per day” – Offering a solution to a problem or trying to address a pain point is a good strategy when writing an email subject line. Duolingo gave a great offer while trying to solve a problem. 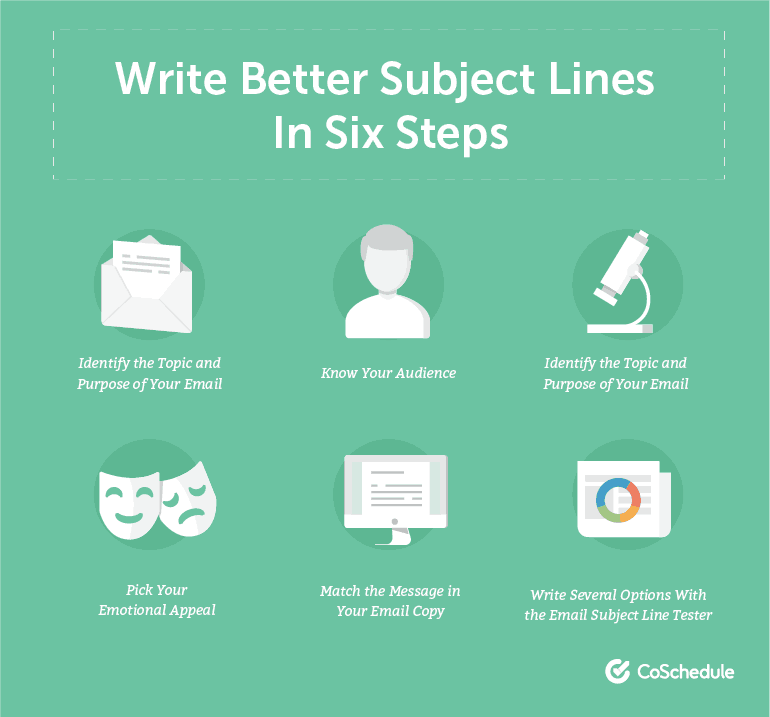 Here are some of the factors which contribute towards a good subject line. Curiosity: Curiosity is something which works wonders. Add text or content which will invoke interest in the reader’s mind. However, do not be too obscure that the email gets reported as spam. Urgency: Using urgency is a classic approach and generally works because it compels the reader to take immediate action or at least gives the feeling that something is of utmost urgency. However, there are more subtle ways to express urgency and that is how it should be. Relevance: One of the most important thing for subscribers is to receive timely and trendy information. This needs to be leveraged while designing subject lines as well. Trendy topics or trendy headlines should be used in subject lines to keep your readers interested. Personalization: Personalization always works because different people have different preferences. Personalization gives a feeling of importance and is liked by subscribers. It is one of the best strategies in Content Marketing that not only helps to retain good relationships but also in lead generation. Celebrity Branding: Use a familiar name with which people can identify. Personality traits of celebrities can invoke curiosity in the recipient to open the mail. Keep it short and simple. use concise language. Make the recipient feel special. Give an engaging pretext. To know more about other email marketing tips on effectiveness and reach, read this. As a marketer, it is very important to know how to improve and increase the efficiency of all your marketing campaigns. For good ROI on Email Marketing by improving open rates with apt subject line and other marketing strategies, take a look at our value-added deliverable. You Will Love These 10 Email Campaigns More Than We Do!